I have been very good and not done any more of jumper number three (which is actually a cardigan) before doing jumper number two although I did accidentally cast on some socks (I am determined to make some that actually fit somebody but I will save the story about sock disasters for another day) but seriously, who could argue with the fearsome beast that was guarding jumper number two? 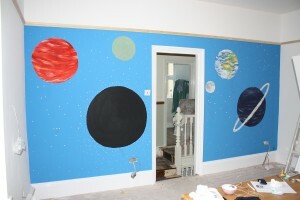 I have done a sleeve and a bit so it is coming on slowly. The other reason I keep putting it off is that I am knitting it back to front. I used to think I knew a lot about knitting but the more I learn, the more I realise there is that I don’t know. A few months ago a friend asked me to remind her how to knit – she had learnt before but was a little rusty, I’m not great at explaining things anyway but she was holding the wool in her left hand and I couldn’t work out quite what she was doing so we didn’t get on very far. She worked out what to do anyway without me interfering but it made me remember something I had read about continental knitting and it turns out that’s what she was doing. I was taught the English/throwing method where you tension the wool with your right hand and kind of flick it around the right needle to make a stitch but with the continental method you tension the wool in your left hand and scoop it up with the right needle instead. The bit of me that is vaguely an engineer (very, very, very small bit) can see that that this should be quicker just because things are moving less far for each stitch so I tried to teach myself and made an experimental jumper. Experimental because I knit the whole thing with the wool in my left hand and also it was the first time I had knit a big thing in the round and it is a great pattern because it taught me a bunch of other techniques that I didn’t know existed. I would show you a picture of it but most of the photos have got my grumpy Christmas face in so I won’t. If you want to learn more about the different techniques then stick it into Google, there are loads of tutorials and this is waffley enough already without me trying to explain properly. I promised my friend a jumper for her birthday last year, she was supposed to be choosing a pattern, I was supposed to be nagging her to choose a pattern and eight months later she saw my jumper and said she would like one like that. The size I did first time round fit her ok so I am making one the same which means the tension needs to be the same which mean I don’t dare knit it with the throwing method in case it turns out a different size. I am still quicker at throwing anyway but also I have super bendy thumbs which go more or less from -90° to +90° (I did contemplate showing you a picture of that but I thought you probably didn’t need to see) and the way I grip the needle for continental knitting means my thumb bends the wrong way, it’s not uncomfortable but if I do it for too long my thumb seizes up (which is sad) so that is my excuse for putting off jumper number two, that and the cat. In other knitting news, I finished the rainbow hat but I haven’t written it down yet, I really should do it before I forget what I did. 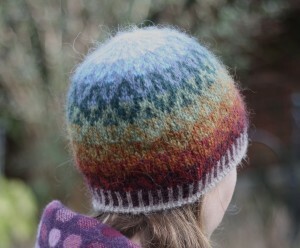 And I put the other hat pattern onto Ravelry where it has been downloaded over a hundred times already. That’s probably not very many in the scheme of things but it’s enough to remind me how terrifying the internet is. 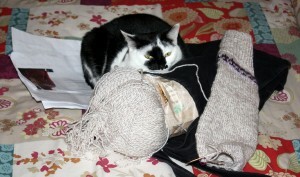 This entry was posted in Knitting and tagged Cats being silly, Jumpers, Stories for another day, Things I didn't know. Bookmark the permalink.